The top and shelf are made from the same wood that Toybox #3 uses, glued together to form single planks. The railing around the shelf is rabbeted into the sides of the shelf for additional strength and stability. Several hours of sanding and varnishing produced that glossy look! 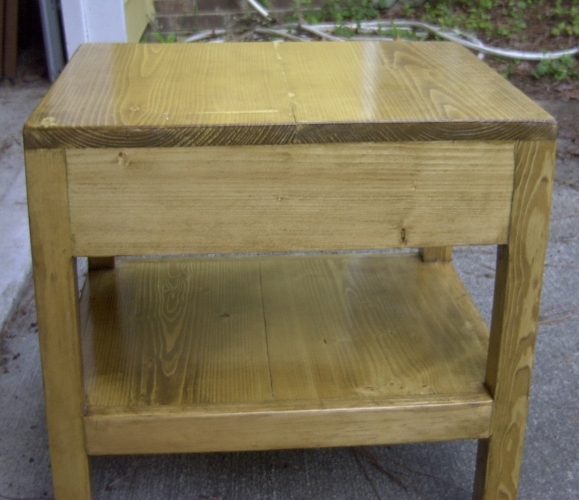 I made this end table out of leftover wood from Toybox #3. It’s about 18″ on a side and 24″ high as well. The legs are 2″ square and everything is glued together except for the table top, which is screwed down into the legs. The color is the same Golden Oak I’ve used on most everything else. I needed an end table that I could keep near my computer to set books and reference materials on, and have a shelf to store stuff on as well. I used leftover wood from Toybox #3 to make this table, and it is stained with similar coloring to the coffee table. 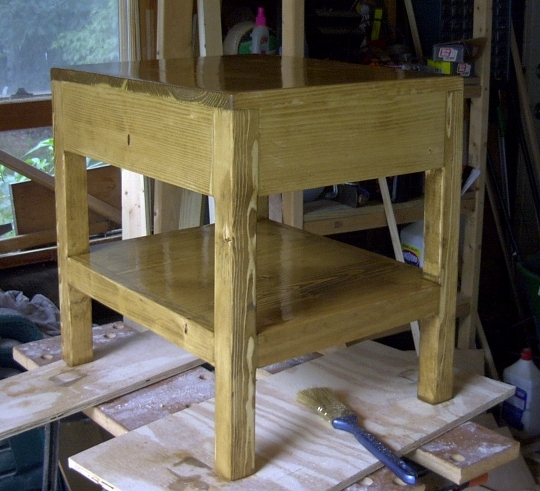 The table is about 18″x18″x24″ high, and has a shelf underneath the top. The wood is white birch for the 3/4″ planks and white pine for the 2″x2″ legs. I used glue and wood screws to join the pieces together, then sanded and stained them to the desired color.